My supplies arrived, and I’ve begun repairing the broken sprocket holes and splices, adding leader tape, viewing, digitizing, re-housing, and determining dates and titles for the films in my sample. There was a real do-it-yourself atmosphere in the archives this week as the students and interns found creative solutions to mend and modify some of our instruments. 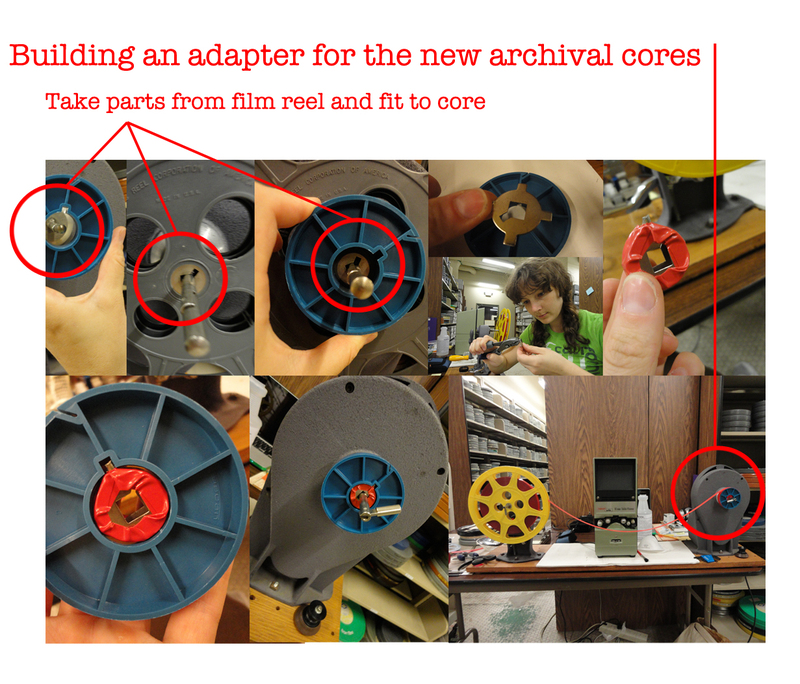 Our very own student assistant Richard Johnson repaired our 8mm projector, and I built an adapter for our film rewind. Some of you might have noticed the green box sitting in my workspace. It is a Moviola film viewer, and it lets me look at the films without having to risk damaging them in a projector. I’ve been using it to view parts of the films that are too brittle or shrunken to play safely through a projector. However, many of the films are in good enough condition to watch, and I began to digitize a select few. Among these films was one I discovered hidden away in a photograph collection. 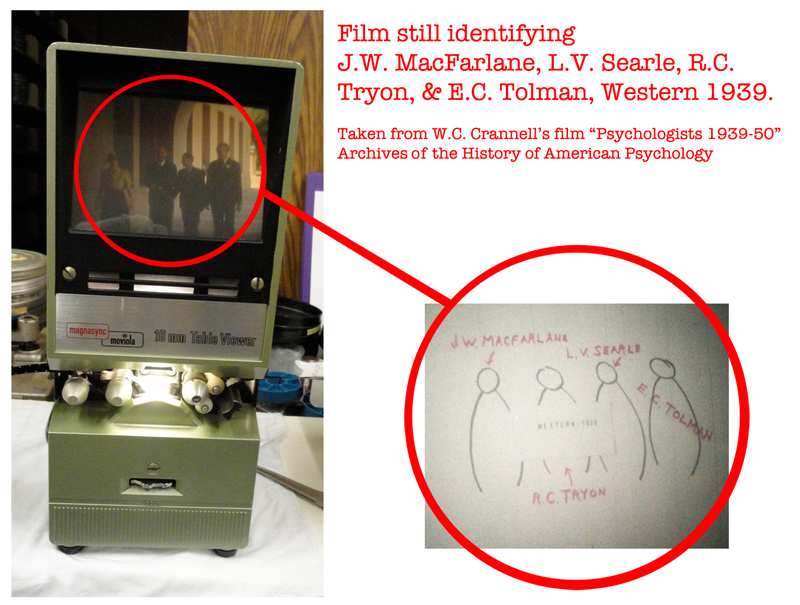 The film “Psychologists 1930-50” is a mix of footage taken at a variety of conferences by psychologist Clarke W. Crannell. The subjects of the film include Edward C. Tolman, Kurt Lewin, Knight Dunlap, Clark Hull, Wolfgang Köhler, Ernest Hilgard, Joseph L. Stone, Lester F. Beck, Erik Erikson, Harry Harlow, Kenneth W. Spence, Louis Leon Thurstone, and many more. Crannell labeled each shot, and in some cases even drew small diagrams identifying each person. What I am most excited about however, is one particular shot about 6 minutes in which Crannell captured two unidentified female psychologists and Clark Hull, each with his or her own camera, taking moving image shots of each other! The film clip does give me hope that there are more gems like this one waiting to be uncovered. After 24 grueling hours of waiting for the A-D test results, I finally got to open up the first set of film canisters! If the strip stays blue (a rating of 0-0.5), then the film is still in good condition. A green strip (a rating of 1-2) means that the film has begun to decay and is at risk (within 5 years) of warping, shrinking, and becoming brittle. A yellow strip (a rating of 2.5-3) means that there has likely already been irreversible decay, and the film requires immediate attention. The first strip came back with an acidity rating of 1.5 (green). I had expected the 1934 film, titled “Decorticate Dog – Behavior and incidental CR”, to have that kind of result. However, to my surprise, when I opened the film canister for the 1929 Eastman Kodak educational film “Frequency Curves”, I saw that the strip had remained blue! With an acidity rating of only 0.5, this film is still quite viable. 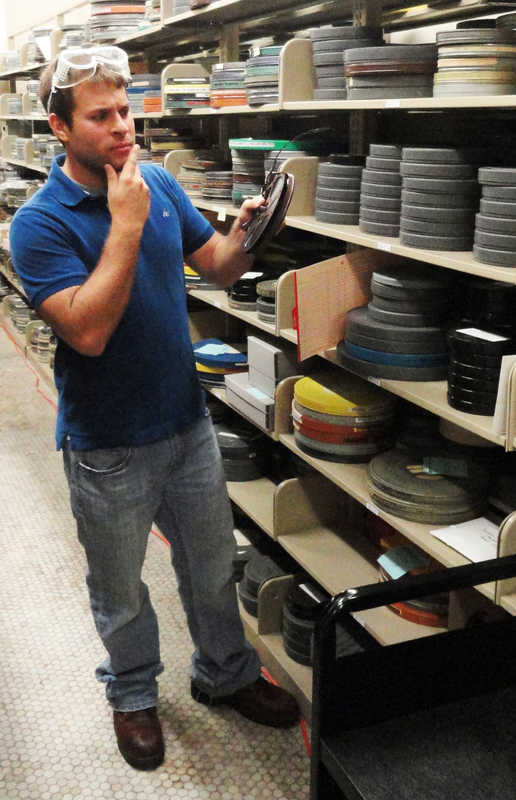 Polymer Science graduate student, Joey Scavuzzo, examines the film. Hoping to get a better understanding of the chemistry behind the process of acetate decay, I met with Polymer Science graduate student, Joey Scavuzzo, who specializes in Polymer Synthesis . We discussed just what an acetate film was, and how it comes to generate acetic acid vapor. Apparently, film is a polymer (meaning a molecule made up of a long chain of chemical bonds)! Most of the bonds in that chain are strong; however, when they come into contact with heat and water (for example), the bonds holding the acetate gas side groups can break down. It is when those molecules break free that the film properties change (warping, shrinking, breaking). “So why don’t we just store all the films into the break room freezer?” I asked. Well, that would be good and fine, he replied, so long as we could control the relative humidity of the freezer, and so long as we never opened the door. He explained that the cooler air in the freezer would have lower humidity than the air outside. And so, just like in the wintertime when you walk inside with your glasses on, water from the more humid room would condense onto the surface of the films. This, of course, would just accelerate the acetate decay. My cleaning and preservation supplies should be arriving early next week. And once I put some of the elasticity back into the films, flatten out any warping, splice up any tears, and add some leader tape, I might actually get to watch (and digitize) some of these delicate artifacts from psychology’s past. The Center was well-represented at the annual conference of the American Library Association, held in New Orleans last month! 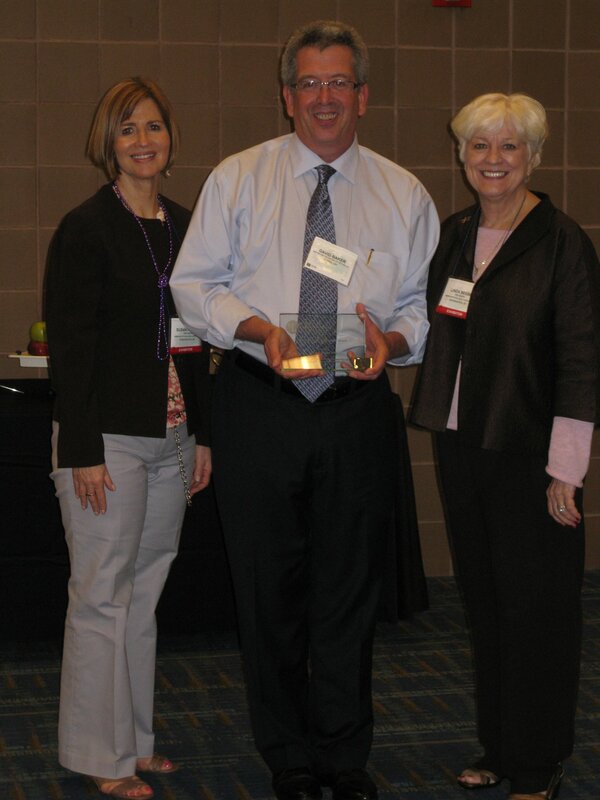 First, CHP Director Dr. David Baker was awarded the American Psychological Association Excellence in Librarianship award at the conference. You can read more about Dr. Baker’s award at the University of Akron newsroom. In addition, I presented mine and Lizette Royer’s work testing visual literacy standards at the CHP on a panel of academic information literacy librarians from five US universities. Our presentation, titled “Visual Literacy Instruction at the Center for the History of Psychology”, focused on an assessment we conducted to gain information on our patrons’ abilities and confidence when it comes to using photographs and other visual materials in our collections. The Center houses more than 12,000 still images and we encourage patrons to use those images as primary source evidence in their research. In order to assess the visual information literacy needs of our researchers, we created a web-based exercise examining their knowledge of and thoughts about visual materials. Volunteer respondents were shown a series of six photographs from collections at the CHP and provided unconstrained space to respond to tasks. 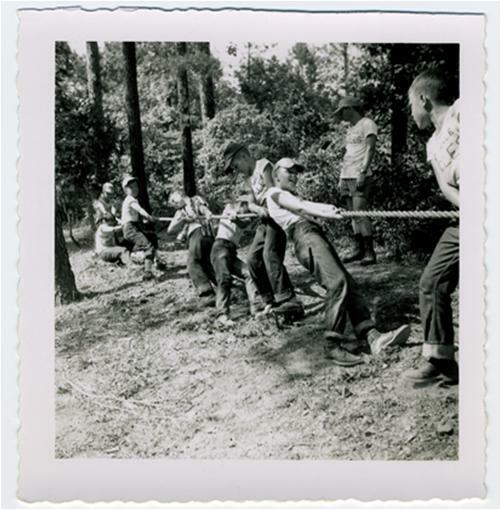 Our assessment showed that professional historians and researchers are fluent and confident when critically analyzing visual information in our collections; graduate students are fluent, with lower confidence in their capabilities than the former group; and undergraduate students seem willing try the tasks, but require our direction and instruction. We also found that even respondents with much experience doing archival research require a simple how-to for citing sources from our collections. 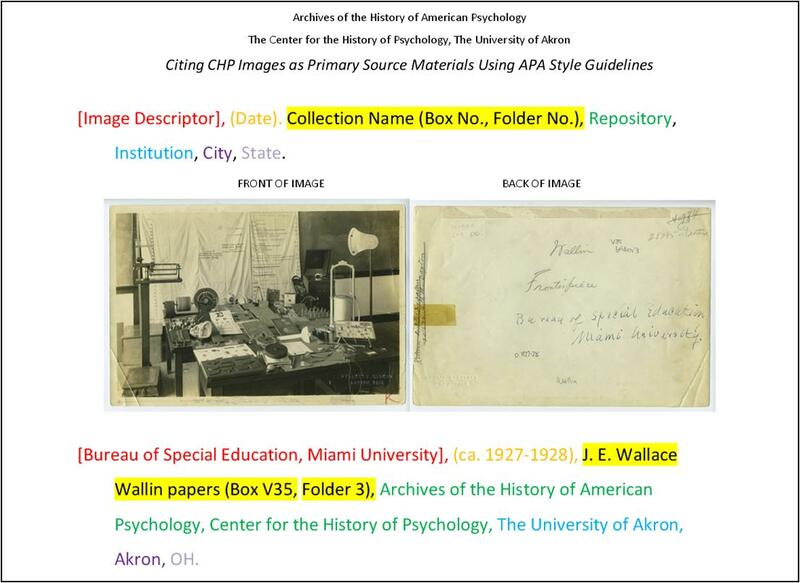 To address this, we have created a brief, user-friendly aid that demonstrates how to cite visual materials from the CHP collections using APA (American Psychological Association) style . Other findings from this project have also led to the creation of instructional material that we hope will help our patrons’ experiences with visual materials more productive. Access to these and all of our instructional materials will soon be available on the CHP website. Jodi Kearns received her Ph.D. in Interdisciplinary Information Science from the University of North Texas. She is the Digital Project Manager at the Center for the History of Psychology. After all the paperwork, my passport is stamped, I’ve crossed the border and started my Student Internship with the Center for the History of Psychology in Akron, Ohio. During my one-month internship, I will be working with the CHP’s Moving Image collection, which includes more than 5,000 titles. I find the prospect incredibly exciting, as my Masters thesis research centered around the Micromotion films of scientific managers and industrial psychologists Frank and Dr. Lillian Gilbreth. 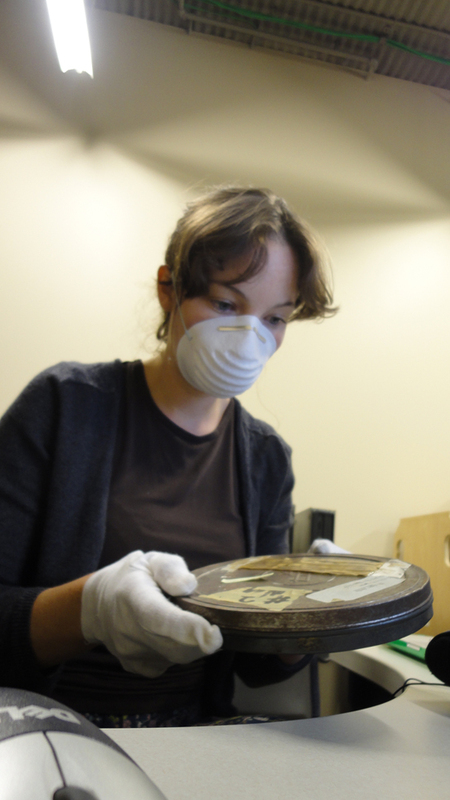 I was able to work with a selection of their film collection, which had been digitized in 2006 by the National Film Preservation Foundation. That research would not have been possible without that digitization effort. And so, my plan at CHP is to assess the film collection, preserve the canisters at greatest risk of deterioration, and digitize (and make publicly available) whatever I can. 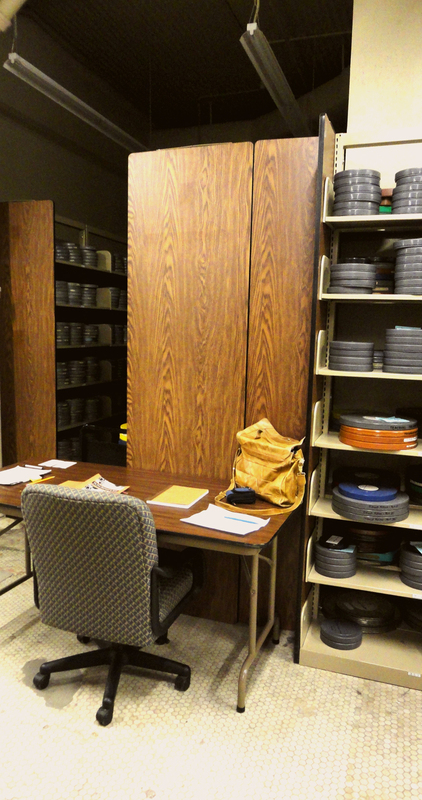 And so, armed with my archive pencil, the National Film Preservation Foundation (NFPF) Guide to Film Preservation, and a positive attitude, I arrived to find a little workstation set up right in the middle of it all. I began by making a list of the materials I need: cotton and latex gloves, a soft cloth, cleaning solution, plastic archival film canisters and cores (or reels), a film splicer and splicing tape, film marker, leader tape, a reel to reel rewinder, A-D testing strips to measure acetate decay, and a film shrinkage gauge. I found an old rusted 16mm film splicer on the currently unused second floor of the new archives building. 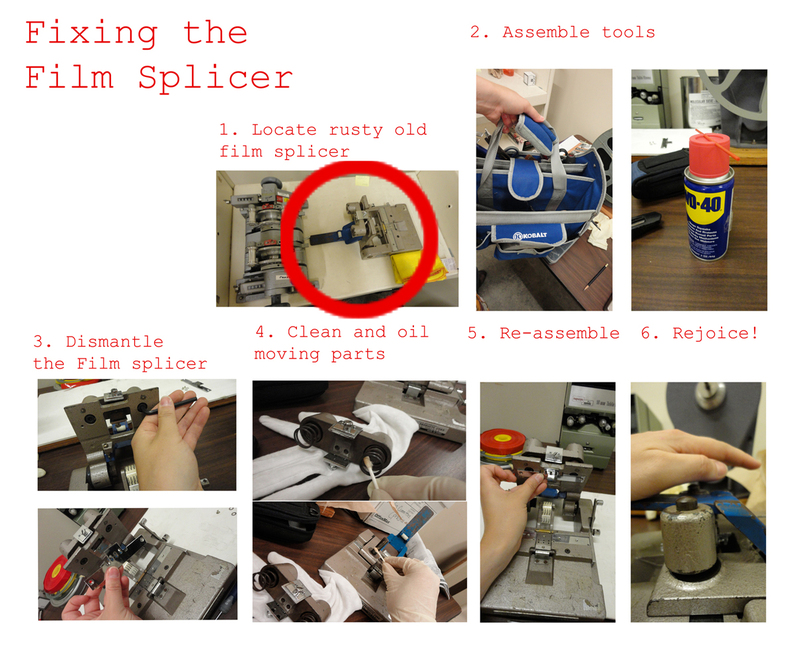 Having used a similar splicer before, I was reasonably sure that I could take the machine apart and get it working again. And so, after making sure that the splicer was a tool and not an artifact, I spent the morning doing just that. I also began testing a sample of films from the stacks with dates ranging from the 1930s to the 1970s. Why did I perform these tests, you ask? Well, let me tell you a little of what I learned about the nemesis of 16mm acetate film: vinegar syndrome! 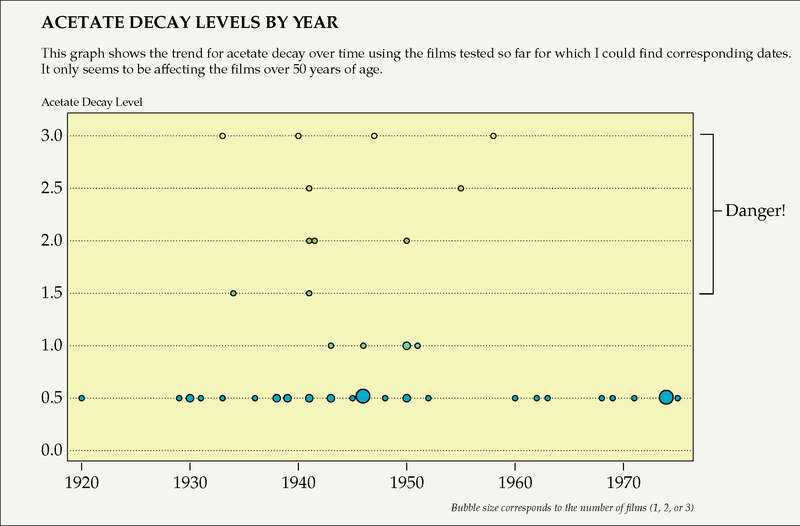 Acetate decay (also known colloquially as vinegar syndrome) is a huge problem for film archives. As the chemicals that hold the plastic base and emulsion gel oxidize over time, the materials release a vinegar gas (hence the nickname) that can infect neighboring artifacts. Worse yet, as the gas escapes, the film plasticity, shape, size, strength, and lubrication degrade. Film can become warped, brittle, and covered in mold. Images become unrecognizable, emulsion can flake off, and if there is even 1% film shrinkage, the perforated holes on the side of the film will not line up with the projector’s sprockets, and the film becomes unplayable. I do not want to let this happen! According to the 2006 A-D Strips User’s Guide acetate deterioration generally begins after a film is 50 years old. So my plan is to select and test some of the older films in the collection, move the ones that are showing signs of acetate decay to a separate area, and clean the films with a solution that will help slow further damage. I’ll have the results of the first test soon, and I am keeping my fingers crossed that the test strips come back blue (and not green or yellow). Stay tuned for the outcome! Welcome to the CHP blog! Blog updates will be posted to our Facebook page and interested readers can receive regular blog updates through an RSS feed. Stay tuned for the first installment, coming next week!